If you read my post from last week, Preview Gmail Messages Before Opening Them, you'll recall that I've been using the Web interface to access my accounts, rather than my preferred option, Outlook. I wouldn't do this unless absolutely necessary, because I find Gmail's interface to be, well, awful. I don't like the look, the lack of a preview pane, the lack of folders...shall I go on? Make no mistake, I love Gmail--just not its UI. Anyway, another problem I've encountered is that unread mail keeps getting pushed off the page by newer messages. And you know what they say: out of sight, out of mind. I need a way to view only my unread messages, without having to click through several pages' worth of mail. 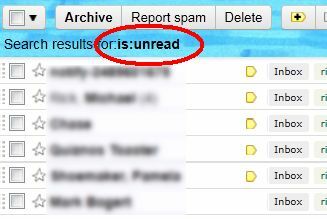 In the Search field, type is:unread and then click Search Mail.